Anyone interested in more information before, during or after the SHOT Show can contact Eric Crawford directly at ecrawford@mace.com 802-753-1272 or Doug Melzig at dmelzig@mace.com or 802-753-1208. We empower your world through safety & security. Mace Security International, Inc., located in Cleveland, Ohio, is a diversified manufacturer and provider of personal defense and security products to consumer, business, law enforcement, corrections, and military market segments under the world renowned Mace® Brand and Take Down® Brands. Since 1970, Mace® Brand has been the original trusted brand for personal defense sprays, while continuously adding high quality security products to the brand line through the years. Mace® Brand supports their products by providing warranty and educational programs for all of the various products and services. Mace Security International directly distributes and supports its branded products and services through strategically targeted customer channels that include mass market retailers, wholesale distributors, independent dealers, e-commerce marketers, and installation service providers. Personal Defense Products: Mace® Brand is the original trusted brand of pepper spray products for self-defense against attacks by people and animals. Mace® Brand has over 40 years experience developing aerosol defense spray dispensing technologies for both the consumer and law enforcement markets around the world. Mace® Brand is the original manufacturer and the market leader in the defense spray segment. Mace Tactical Products. 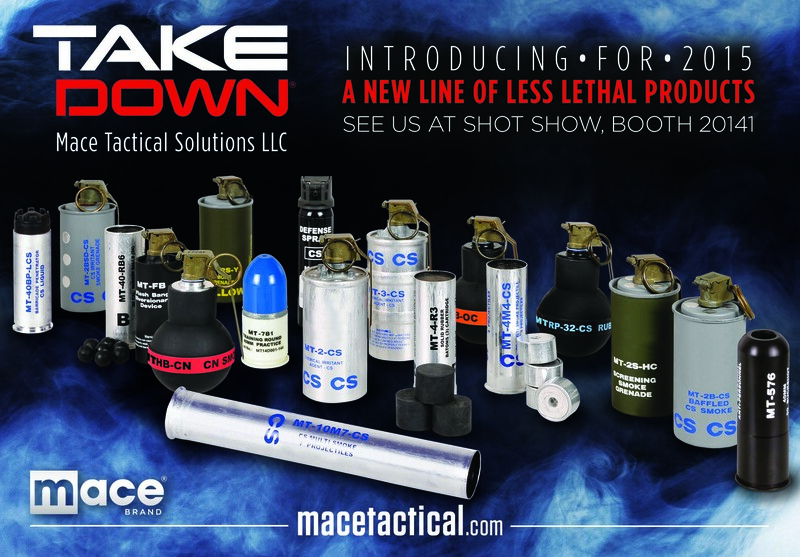 Mace Tactical offers a complete line of Take Down® Brand chemical/impact munitions and flash/distraction/impact grenades to its law enforcement, corrections and military customers. Mace Tactical’s offerings provide its customers a “one-stop shop” for acquiring supplies needed to perform and train law enforcement, corrections and military personnel for their invaluable duties. Electronic Security & Surveillance Products: Mace® Brand has an entire line of high quality security cameras, digital video recorders, observation monitors and installation accessories for CCTV and IP network-based video surveillance, as well as wireless alarm security systems for local and remote monitoring. We design and manufacture surveillance equipment for every need, with both analog and high definition solutions. Security Monitoring Services: Mace® Brand partners with Security Partners which owns three UL/ETL/CSAA Five Diamond listed central monitoring stations throughout the USA providing full-service security & life-safety alarm monitoring to the wholesale security trade. This relationship allows Mace® Brand to provide residential, commercial, and industrial sector customers with alarm, video, and PERS monitoring services through independent security dealers. Our mission is empowering your world through safety & security, and we mean it. We deliver the best in safety and security products and services. Through innovative products, support programs and personal customer service, we are the #1 globally recognized consumer brand in safety and security. Mace Security International, Inc. is pleased to announce that it and Merlin Partners, the holder of its 6% Convertible Debenture (due 3/31/16 and currently convertible at $0.192 per share), have agreed on a repurchase of the debenture. This purchase price is at a significant discount to the Debenture’s current conversion value, while at a premium to the debt’s face value. The elimination of the debenture will result in Mace® saving interest costs over the next 15 months. The repurchase also eliminates the potential issuance of 7.3 million Mace shares at an effective cost of $0.315 per share, a substantial discount to Mace’s current market price. To retire the debt, Mace will utilize a portion of its current excess cash. However, in order to insure that Mace® still has adequate capital and financial flexibility to respond to new product and potential acquisition opportunities that may arise, the Company has obtained commitments from a group of private investors, including some members of Mace’s Board of Directors. These commitments are for standby financing by way of a put arrangement on approximately $2mil of convertible notes on terms more favorable than the current debenture. This arrangement gives Mace® the right to financing if and when Mace’s Board deems it advantageous for the company to borrow under terms of the new notes, which are subject to finalization in January 2015. The put will have a term of two years with Mace® paying a commitment fee of 2.5% annually, enabling cost savings until Mace® exercises the put.